Against all Grain is my grain-free bible. Of all the paleo/grain-free/gluten-free/Whole30-esque cookbooks I’ve read, Danielle’s has been the best resource for home-style, every day recipes that I a) want to eat and b) can actually make (skill and ingredient-wise). When I learned that she was publishing a book of holiday menus and recipes, I couldn’t wait to get my hands on it. I received my copy of Celebrations from Blogging for Books. I really do. Thanks to my grandpa and his friend, we have a lovely bunch of green coconuts to enjoy. So while the coconut water flows, we have an abundance of fresh coconut meat… I already made a batch of macaroons, but I wanted to try something different with some of the grated coconut. I thought there must be some way to make something similar to rice pudding but with coconut, but my searches turned up very few recipes that made use of fresh coconut rather than dried. Then, a stroke of genius… I decided to search in Spanish. After all, the best coconut deserts I’ve had are all Hispanic. Voila! I found the just what I was looking for on a forum for a Dominican recipe site: Dulce de Coco. A tasty treat, similar to rice pudding, but featuring delectable coconut goodness. I adapted the recipe to suit my needs and it turned out wonderfully sweet and full of coconut flavor. A great treat if you have some fresh coconut. Mix the milk, coconut, sugar, cinnamon stick, and raisins (optional) in a medium pan, on low heat. Stir occasionally to keep the coconut from sticking to the bottom and burning. Allow to boil until the mixture thickens, the consistency should be similar to rice pudding. Remove from the heat and allow to cool. Refrigerate for at least 30 minutes before serving. It will thicken further as it cools. Note on the cooking time: I set it on medium-low heat for a little over an hour and a half. The original recipe said it would take 25 minutes, but I halved the recipe and it still took more than twice as long before it reached the desired consistency. 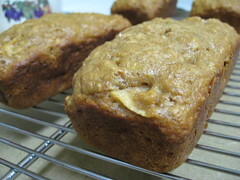 This is my first time making pumpkin bread and I wanted a recipe that featured oats, so I was more than pleased when I found this one on MyRecipes: Kim’s Best Pumpkin Bread Recipe (from Cooking Light). Combine the first 5 ingredients in a medium bowl; stir well with a whisk. Lightly spoon flour into dry measuring cups; level with a knife. Combine flour and next 6 ingredients (flour through salt) in a large bowl; make a well in center of mixture. Add pumpkin mixture to flour mixture, stirring just until moist. Fold in raisins and pecans. Spoon batter into 2 (8 x 4-inch) loaf pans coated with cooking spray. Bake at 350° for 50 minutes or until a wooden pick inserted in center comes out clean. Cool 10 minutes in pans on a wire rack; remove from pans. Cool completely on rack. On a completely unrelated note, I bought a lovely spray of roses to dress up the table (and my room) on Thanksgiving. Yesterday was my b-chan’s birthday so I made him a batch of fresh-baked lemon sugar cookies as a sweet birthday treat 🙂 . It’s been a while since I’ve baked cookies and I wanted to try something different, so I look for a recipe with a lemon twist and found this one on myrecipes.com, lemon sugar cookies from Sunset magazine. I decided to make the dough a day in advance, so that I would have plenty of time to shape, bake, and ice the cookies before having to pack them up. At first, the recipe seemed simple enough… sugar, check, butter, check, eggs, check… until I got to the part where I had to mix the dry ingredients. This recipe calls for two cups of sugar (I used turbinado instead of refined), so I assumed there would need to be a lot of butter and flour to bring it all together. What I did not anticipate was the reality of 5 cups of flour. Have you seen what five cups of flour looks like? Apparently, I had not or I would not have had a mild panic attack wherein I jumped to the conclusion that I must have printed a faulty copy. Surely, the recipe could not call for 5 cups of flour? But it did. I double checked and forged ahead, hoping that I wouldn’t have to scrap the whole thing and buy a box of sugar cookie mix (for shame, think of all that wasted butter, sugar, and flour). Mixing all that stuff proved to be harder than I thought it would be. I’m a poor baker, no fancy kitchenaid mixer here. I have to rely on my handheld and pray that the baking fairies are on my side (and that I won’t burn out the motor again, had that happen once). Well, my mixer couldn’t take it, this required physical labor to mix. I had to press my mom into mixing service, but between the two of us we managed to get something that resembled semi-solid concrete. Wrapping it up, I waited til the next day. This dough is dense. It’s hard and solid when chilled. Let’s not get into how hard it was to roll out. Suffice it to say, the cookies were more work than a cake would have been. Regardless, they taste great, though not as lemony as I would have liked. No matter, half the dough was enough to make 18 shaped cookies and 5 sample drop cookies for taste testing. I’ve frozen the rest of the dough for Thanksgiving and Christmas. This recipe can certainly go a long way. Next time, I’ll add more lemon… and take over auntie Em’s mixer. They’re done! And they taste fantastic! I wish I had more seeds to roast, but this was an incidental sort of experiment, so that’s it for this batch. I reviewed a bunch of recipes and just combined what I liked from each of them to come up with this one. 3/4 to 1 cup fresh pumpkin seeds (our pumpkin yielded about 3/4 of a cup.) Note: these should be washed and dried beforehand. I let them dry overnight after getting all the pumpkin goo off. 1 tbsp unsalted butter, melted. In a bowl, combine melted butter, sugar, and spices until well-coated. Line a cookie sheet with parchment paper and spread seeds in a single layer. Bake for 20-25 minutes, stirring the seeds about halfway. That’s it. Quick and easy.